First in a weekly series of blogs on climate change and population displacement. By Claire Havens, ACT population displacement researcher. Last week on the bohemian, cafe-lined streets of Melbourne, I met a 25-year old Pakistani refugee canvassing for the UNHCR. When I asked him why his family had fled Pakistan to Australia, his answer was direct and clear: “climate change.” Surprised to hear this very frank answer, I probed him further; he revealed that extreme and unprecedented flooding in the valley where his family lived, combined with irresponsible forestry practices in the surrounding mountains, had destroyed his village and their way of life. They were fortunate to find refuge in an OECD country through the tightly controlled and sluggish official refugee application process. I say fortunate, because many desperate migrants seeking refuge in Australia attempt to make the journey by boats and, when intercepted, are detained in camps for years on offshore islands such as the Micronesian nation of Nauru. For the past month, headlines around the world have been focused on the European migrant (refugee) crisis. Politicians and decision makers have pledged to do more, speed up government response to the crisis, provide aid for UNHCR refugee camps, and continue either military or intelligence activity against ISIS in Syria where many of the refugees are from. In Canada, the upcoming election has heightened the debate with party leaders attempting to outdo each other on how many refugees they think we should take in, and how best to respond to the conflict in Syria. While it seems as if this crisis came out of nowhere, many climate change and migration specialists have been predicting mass exodus of people from climate vulnerable countries for over a decade. In 2008, when Gwynne Dyer released his book “Climate Wars” foreseeing an increase in failed states and conflict exacerbated by climate change, and waves of refugees globally, this perspective was seen as alarmist. In 2015, it is far more prophetic. Climate change will result in significant migration, both within countries, and from more vulnerable regions across borders to more stable areas. Sea level rise, extended droughts, flooding – all will contribute to the destabilization of political and economic systems, as well as directly affecting residents of vulnerable coastlines, parched agricultural land, or degraded watersheds. A wonderful graphic representation of the chain reaction set off by an extended drought in Syria, leading to the political strife and conflict we see today, can be viewed here. 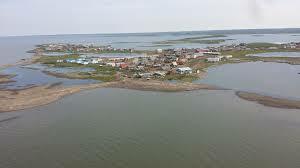 This is an important warning for Canada, where we are already seeing the effects of melting permafrost on remote northern communities such as Pangnirtung or sea level rise in Tuktoyaktuk. Internal population displacement is already occurring, and while the world and Canada’s attention turns to desperate people in refugee camps in the Middle East, we should also be preparing for movement within our own borders. Vulnerable people the world over will be most severely impacted by the effects of climate change and related political and economic upheaval. It’s high time we develop a cohesive strategy for how we define, plan for, and welcome diverse “climate refugees” and internal displaced peoples over the coming decades.